Summary: Suspicion about new food is the issue here. 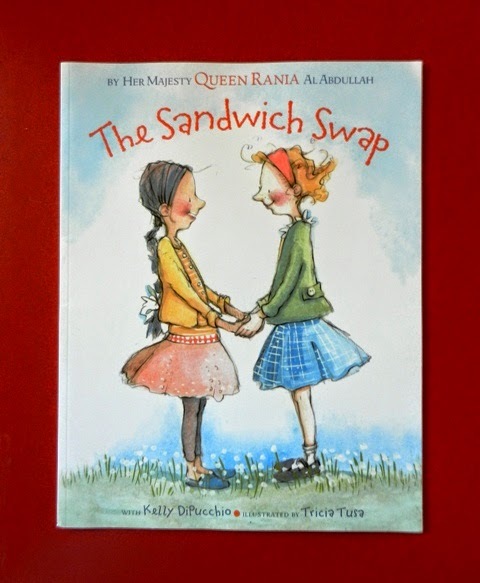 Despite Lilly and Salma’s mutual friendship, BFFs even, each girl is concerned about the kind of sandwich her friend eats for lunch. Lilly eats peanut butter and jelly. Salma eats hummus on pita. Eventually these doubts are expressed, feelings are hurt, anger bubbles to the top, other students choose sides, and a cafeteria food fight ensues. When they are called to the principal's office, feelings of shame surface. The next day at lunch, Lilly and Salma try each other’s sandwiches and are delightfully surprised and are inspired to have an international food event at school. Hanna’s Comments: Sometimes something as small as a sandwich leads to poor assumptions and discrimination. This story demonstrates that being open to other’s differences and being willing to step into another’s shoes, can lead to new delights and stronger relationships. This story is based on the queen of Jordan's own experiences with a friend. This is explained in a great author’s note at the end. Idea(s) for Application: Read this book as a part of an Inter-religious Food Festival focusing on how various faiths use food in their rituals. Or read it in a lesson for children about judgement or forgiveness.